On 20 June 2013, a Thursday, an estimated 1.25 million people participated in protests throughout Brazil, in a show of mass popular unrest rarely seen before. Though the initial impetus for the demonstrations had been the Movimento Passe Livre (Free Fare Movement) – an 0.20 cent increase in public transport fares – the agenda widened as the month went on, taking in other, sometimes contradictory grievances, including police violence, the rising cost of living and the impact of the World Cup and Olympic Games. This show of popular dissent over several days came to be known as the ‘Jornadas de Junho’ (literally, ‘June Days’). Further mass protests followed in Brazil in 2015, driven by indignation at corruption scandals involving President Dilma Rousseff and the Partido dos Trabalhadores (PT) (‘Workers' Party’) that she headed. This led to the April 2016 vote to impeach the first woman to occupy the highest executive position in the country. Members of Congress referred to torturers under the dictatorship, praised the military coup of 1964, and mentioned family and God as a justification for their vote, thus making it obvious that the main accusation, the so-called ‘fiscal pedaling’, was not actually the real reason for Rousseff’s dismissal. Michel Temer assumed the presidency in what was, for many, a ‘coup d’état’. In light of these developments, there are some who think that after June 2013 Brazil took a turn to the right with the emergence of conservative and extremist discourses. This political setting helps to build a set of objective and subjective elements for the history of recent student protests in Brazil. In 2015 and 2016, three waves of students’ occupations in public schools took place throughout the country – even though many of them sought to distance themselves from party rhetoric and political polarisation. Through micropolitics – seen in the way dialogue was conducted, forms of organisation and changes of political behavior of the high school students of São Paulo – these school occupations imprinted a collective-based consciousness on a whole generation of Brazilian students, putting in motion political dynamics that bring up aspects from the experiences of the anti-globalisation movements in the late 1990s. The so-called Primavera Secundarista, or ‘Student Spring’, started on 23 September 2015, with the disclosure by the governor of the state of São Paulo, Geraldo Alckmin, of his ‘school restructuring’ plan, involving the closure of almost 100 public schools and the transfer to other schools of around one thousand students. The plan sought to break up ‘educational cycles’: schools would have to exclusively accept either Fundamental I cycle pupils (6–10-year-olds), Fundamental II pupils (11–14-year-olds), or Middle cycle pupils (15–17-year-olds). Brazil’s Secretary of Education claimed that there had been a decrease in the number of pupils in the public school system in recent years, and that, therefore, schools needed to close and merge. The weakness of this argument and the fact that teachers and students were excluded from the discussion on reform generated much discontent. Students barricaded the entrance to Colegio Estadual Central do Brazil in Méir, Rio de Janeiro, May 2016. Image: Sofia Leão. All rights reserved. Tired of the authorities' obstinacy and the ineffectiveness of street actions, high-school students took over 200 public schools across the state of São Paulo, forming the first wave of school occupations in the country. After that, the students came up with more alternative and creative ‘direct action’ initiatives to put additional pressure on the government. By making a gesture of appropriation (‘A escola é nossa!’ – ‘The school is ours!’), students challenged disciplinary education, arbitrary hierarchy and the deterioration of teaching conditions. 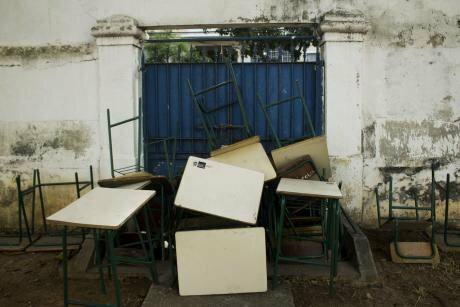 A month or so later, in December 2015, the proposed restructuring of schools in the state of São Paulo was suspended. News of the victory of the São Paulo students spread across Brazil, inspiring a country-wide high school student movement. In 2016, the seeds of the previous Primavera blossomed again; students began to coordinate actions in different states, and the occupations model rapidly spread around the country. In the state of Goiás, in early 2016, only a few days after the success of their São Paulo peers, high school students organised some 30 occupations to demonstrate against the threat of privatisation of public education, proposed by the state through a model of shared administration between state and private non-profit entities. Between March and April, students from the state of Rio de Janeiro took to the streets to protest against spending cuts and in support of a teachers’ strike. A month later, 70 public schools in the state had been occupied. In the same period, students from the northeastern state of Ceará staged protests against the degradation of public education. In addition to demonstrations, they occupied 12 schools. Meanwhile, a scandal concerning the misappropriation of resources earmarked for school lunches in municipal and state schools triggered new occupations in the state of São Paulo in April and May in places such as the Paula Souza Center and Sao Paulo’s Legislative Assembly. In May and June, students from Mato Grosso joined the revolt, protesting against the privatisation of 76 schools in the state through public-private agreements, by occupying around 25 public schools. And high school students in Rio Grande do Sul also saw occupation as a powerful resistance tool, mobilising against the lack of investment in the public system, and threats of privatisation, by occupying approximately 120 schools across the state. 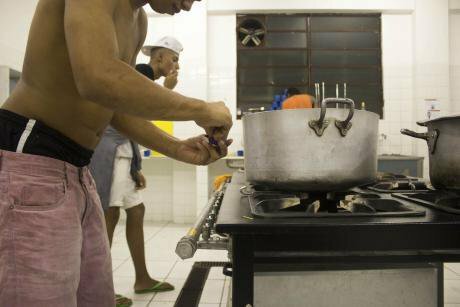 Students preparing dinner during an occupation of Colégio Estadual Visconde de Cairu in Méier, Rio de Janeiro, May 2016. Image: Sofia Leão. All rights reserved. After the two first waves of occupation, some of the local governments responded to the students’ demands. At Goiás, for example, a sentence at the state’s judiciary suspended the call for private organisations to take charge of the administration of public schools, which is considered a punctual victory against the privatization of public education even though this threat is still present in the country as a whole. In Sao Paulo, four days after the occupation of the state’s Legislative Assembly, in May 2016, a Parliamentary Commission was created to investigate the corruption scandal of the provision of school lunches. On the other hand, more than one year after the complaints were made to the Parliamentary Commission, nobody was punished in São Paulo. 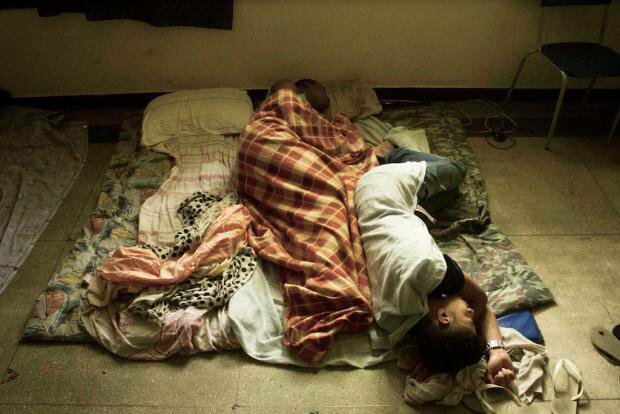 In states such as Rio de Janeiro and Ceará, the already poor conditions of the public education system only got worse. Brazil experienced a third wave of occupations – the largest ever recorded in the country’s history – in the second half of 2016. Between October and December, 21 (out of 27) states of the federation saw the occupation of public education institutions. In this third wave, however, the triggers were national, not local. In September 2016, the Ministry of Education published a bill for the reform of public high school education – the ‘Middle Cycle Education Reform’ – proposing changes to the structure of the curriculum. This proposal – which the government again drew up without effective prior consultations with teachers or students – caused a great deal of uncertainty and insecurity. The students quickly mobilised again, organising the first school occupation of Curitiba, the capital city of the state of Paraná. The movement from Paraná grew rapidly, with 850 schools soon being occupied. After this, a third wave of occupations spread around the country, involving almost 1,200 schools. As the protests spread, support for the agenda grew, centering around three main points: (1) resistance to the proposed ‘Middle Cycle Education Reform’; (2) rejection of the constitutional amendment proposal (PEC) 55/2016, limiting public spending for the next 20 years mainly in the sectors of health and education; 3) rejection of the proposed ‘School Without Parties’ law, also known as the ‘ley de la mordaza’, or ‘gag law’, which sought to control and persecute teachers expressing ideas considered as “leftist” or “Marxist”, the so-called ‘ideological indoctrination’ in classrooms. At the same time, each school added local needs to this agenda – such as lack of teachers, precarious facilities, violence in educational institutions, debates on sexual diversity and women’s empowerment and self-defense. A few days after the third wave had gained its full strength, college students occupied state and federal universities throughout the country in solidarity with and support of the school occupations. According to information disclosed by the União Nacional dos Estudantes (National Union of Students) (UNE), 229 institutions of higher education were occupied in approximately 40 days. This served to counterbalance pressure from local communities, the government and the media for the school occupations to end. In the second half of October 2016, the protests began to lose strength due, on the one hand, to the refusal on the part of the federal government to review the reforms, and, on the other, to the actions by the state to evict school occupiers. Intense police violence and repression against the students marked the end of the third, nationwide wave of occupations. Coercion came also from counter-protest movements that were in favour of the educational reforms and budget cuts, such as the Free Brazil Movement (MBL) and other conservative groups. A student cleaning the women's bathroom on the last day of the occupation of Colégio Estadual Visconde de Cairu, Méier, Rio de Janeiro. Image: Sofia Leão, All rights reserved. As we have seen, the first and second wave of occupations implied some positive gains at the local level such as blocking reforms, obtaining some response to cases of corruption and suspending privatization projects. At the national level, however, two out of three bills that were contested during the second half of 2016 were approved. The ‘Middle Cycle Education Reform’ and the constitutional reform limiting public spending in education have been in force since the beginning of 2017. Despite strong opposition and the fact that it has been declared as unconstitutional by the federal Public Prosecutors’ Office, the third bill, ‘School Without Parties’, is still being studied at the National Congress but also at several states and cities, through local bills inspired by the national one, making it a constant preoccupation for students and educators. In spite of these negative results and the repressive and criminalising state reaction, the Primavera Secundarista movement is to be celebrated: the resolute students, or ‘firmes’ (a label coined during the Paraná occupations), transformed schools into political laboratories in a way never seen before in the history of Brazil. The students acquired knowledge on confrontation formats and built skills of resistance. The occupations heightened the need for them to organise and mobilise in a collective but autonomous way. It also allowed the students to communicate with society and the state, and to exercise their rights to quality public education without their agenda being subsumed by other social and political groups. By exercising their political rights, the students gained confidence. Young Brazilians came out of the occupations more politically conscious and ready to fight for a more questioning and inclusive society and to defend their rights in the face of oppression by the state, society and the media.